The current water industry focus is to reduce energy consumption, minimise chemical usage and optimise treatment processes. Ultimately the aim is for water utilities to become more efficient and reduce operational costs. The direct measurement of ammonium and DO (dissolved oxygen) measurement are increasingly combined to improve waste-water treatment process control. The correct choice of instrumentation, to perform reliable ammonium and DO measurement directly in the aeration tank, is critical to achieving efficient control. The sensor design including the stability of calibration, membrane material selection, digital sensor communications, diagnostic interfacing and robustness of construction, are just a few of the considerations. Biological fouling needs to be minimised especially in the UK where routine maintenance is less frequent and automatic cleaning systems have therefore also often been integrated. Performed well, process optimisation can reduce energy consumption and reduce operational costs. However poor instrument selection will not provide reliable ammonium and DO measurement which can then impact upon effluent quality without reducing operational costs. The IQ Sensor Net - ammolytplus and FDO sensor technology is arguably the best in class, for nitrification process control. 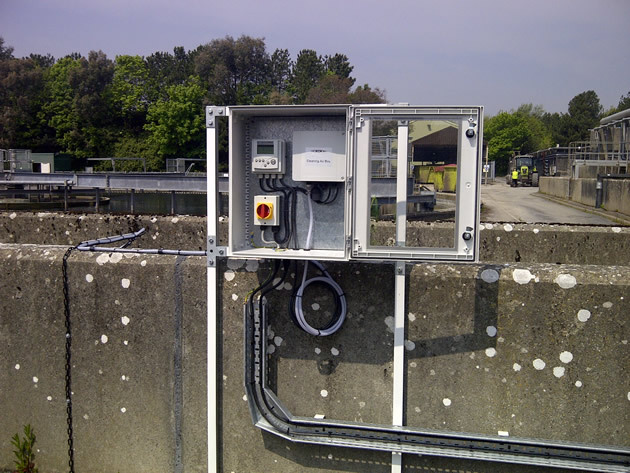 Installations include feed forward and feedback control of the aeration process often configured to maintain target concentrations of ammonia within treated effluent.